One of the best creative tools Elements has to offer is layer masks. Masking is essentially just another way of making a selection. Instead of making a selection with a single selection outline — either it is selected or it isn’t — masks enable you to define your selection with up to 256 levels of gray (from white to black). You can therefore have varying levels of a selection. Here’s how it works. First, think of a layer mask as a sheet of acetate that hovers over your layer. To add it to a layer, click the layer mask icon (dark rectangle with a light circle) at the top of the Layers panel. Then, with any of the painting tools (Brush tool, Gradient tool, and others), you apply black, white, or any shade of gray onto the layer mask. Where the mask is white, the image on the layer is selected and shows. Where the mask is black, the image is unselected and is hidden. And where the mask is gray, the image is partially selected; therefore, it partially shows. The lighter the gray, the more the image shows. By default, the mask starts out completely white so that everything is selected and shows. Creatively blend one layer into another. If you want one image to gradually dissolve into another, using a layer mask is the way to go. Try using the Gradient tool with the black-to-white gradient selected to create a soft dissolve. 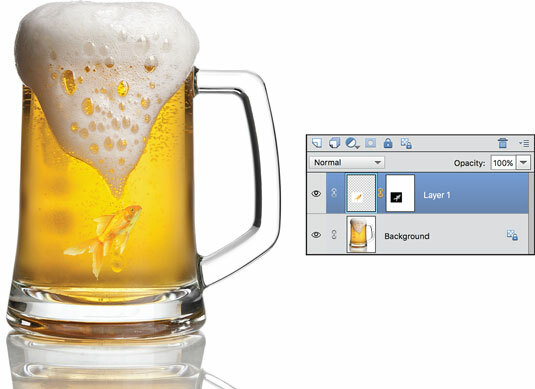 You can use layer masks to blend images together in a realistic manner, as shown in the figure, where a goldfish and a sudsy brew are combined. In the figure, you can see where it was painted with black to completely hide the original background of the fish image. Light gray was painted on the fish to make it appear as if it is truly “swimming” in the golden liquid. In other words, some of the liquid of the underlying glass of beer image shows through to the fish layer. Adjust your layer mask to selectively show and hide the effects of the adjustment layer. • Apply a filter to your layer mask to create an interesting special effect. One of the best aspects of layer masks is that you can endlessly edit them. Unlike just making a feathered selection, you can keep adjusting how much of your current layer or underlying images show. Or you can adjust how gradually one image blends into another: Simply change the areas of white, black, and gray on the layer mask by painting with any of the painting tools. Just make sure you select the layer mask and not the image. When you select the layer mask thumbnail in the Layers panel, you see the appearance of an outline around the thumbnail. You can’t add a layer mask to a background. You must convert the background into a layer first. If you’re just not up to tackling a layer mask, you’ll want to check out the new Double Exposure Guided Edit. You’ll find it under Guided → Fun Edits→Double Exposure. This great new edit enables you to easily merge two photos and also apply various preset effects. Add a layer mask to blend one layer into another. To load the mask as a selection outline, simply Ctrl-click (Command -click on the Mac) the layer mask thumbnail in the Layers panel. To view the mask without viewing the image, Alt-click (Option-click on the Mac) the Layer Mask thumbnail in the Layers panel. This trick can be helpful when editing a layer mask. Note: Many of the preceding commands are also available in the Layer → Layer Mask submenu.